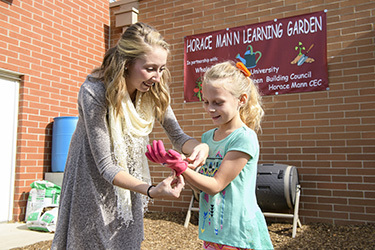 The College of Education and Human Services Professional Development School Network is based on a strong collaboration between Wright State University faculty and individual school and community sites. These individual relationships encourage the preparation of Wright State University students for their chosen profession, increase achievement of site students/ clients and offer the opportunity for research into improving best practices. The Professional Development School (PDS) is a collaborative institution formed through a partnership between Wright State University and P-12 schools. The PDS is more than a site of field placement for teacher candidates. Its main focus is the preparation of new teachers, faculty development, inquiry directed at the improvement of practice, and enhanced student achievement. The PDS may be in challenging settings, they may have complex missions, but ultimately they are learning environments that support candidate and faculty development in the context of meeting all students’ needs. The PDS is based on principles founded in the Nine Essentials of the National Association for Professional Development Schools (NAPDS), the Four PDS Standards of the National Network for Educational Renewal (NNER), and the Five PDS Purposes of the Council for the Accreditation of Educator Preparation (CAEP). Currently two schools are members of the Professional Development School network. The Professional Development Community (PDC) is a collaborative institution formed through a partnership between Wright State University College of Education and Human Services and community rehabilitation organizations. The PDC's goals are to prepare graduates, increase faculty development, provide inquiry for improvement of practice, and enhance consumer independence. A member of the PDC is more thana site of field placement for rehabilitation practitioner candidates; it is an active participant in the preparation of future professionals, faculty development, and inquiry directed at the improvement of practice, and enhanced consumer independence achievement. The PDC may be in challenging settings, they may have complex missions, but ultimately they are learning environments that support rehabilitation practitioner candidate and faculty development in the context of meeting all consumers’ needs. Community members have greater access to Wright State’s student body, participate on advisory council on degree programs, and collaborate with the university in a variety of important ways. The members also have the ability to network mutually beneficial goals amongst themselves. Member organizations demonstrate high ethical standards and are recognized as leaders in the community. The PDC is based on principles founded in the Nine Essentials of the National Association for Professional Development Schools (NAPDS), the Four PDS Standards of the National Network for Educational Renewal (NNER), and the seven core values of the National Rehabilitation Association (NRA). Ms. Ryan Taylor is the Internship/Community Engagement Coordinator and is the facilitator for the Professional Development Community. There are currently ten member organizations.